Last year I created a 5 game series of the first day of the Some in 1916. This saw the 5 British Corps attacking the German lines after a 7 day bombardment. At the time I considered then creating a game that would take the story all the way from the second day to the campaigns end in November that year. Other things came up, other games went forward but now I have been spending sometime working on this game. Having created a basic feasibility document, which included a turn sequence and concept framework I needed to move forward to creating a prototype, and then developing the rules through game testing. In the picture the map of the Somme has been reduced to a network map of nodal points, and the units abstracted a little to show the corps axis of attack. 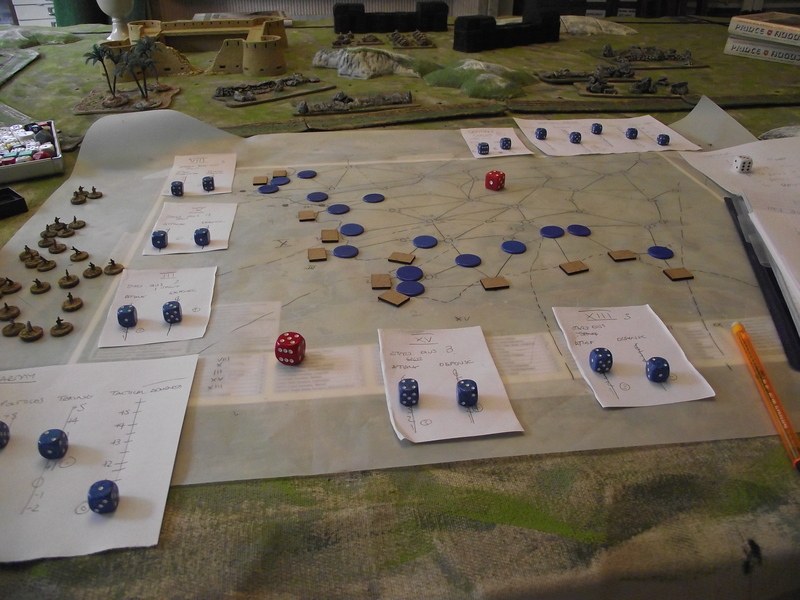 The idea behind the game is that it is an army level resource management game – the actual combat is quick and easy, but reflects the bits and hold strategy then used. The idea is the general, the player, has to manage logistics, reinforcements, politicos, training and doctrinal advances. All this then feeds into the strength, number and capability of the units in the front line. The game represents 20 weeks of fighting in the Somme so with this timescale wider issues such as politics and training can be incorporated. An event mechanism will allow the addition of divisions, specialist units, artillery bombardments and political events such as commander changes, all randomised to allow repeatability. 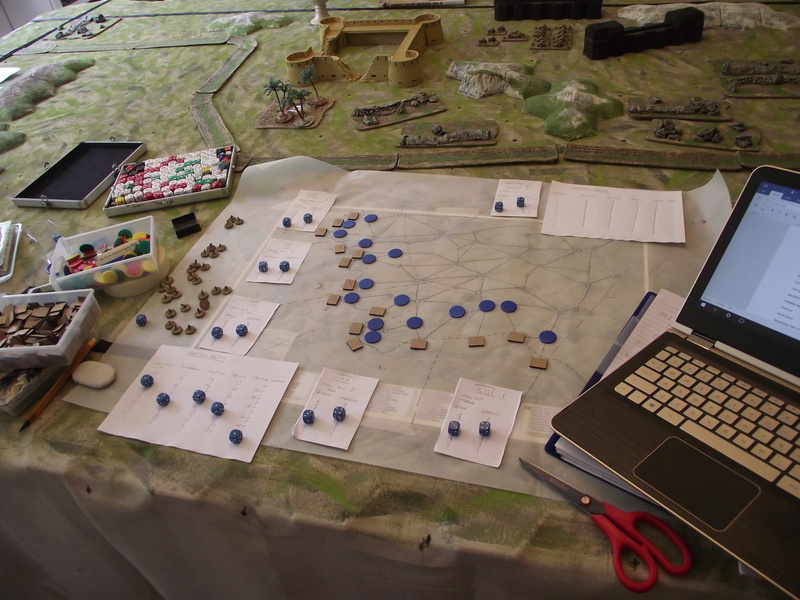 Having got the fundamentals right – this needs a lot of play testing to tweak the tables………..
Good luck with your project. I seem to remember that the losses were staggering on the first day for the Brits. Nearly 60k on day 1. Please remember that Haig was (in my opinion) a terrible commander whose plan was a disaster. Sure, it was political in terms of attempting to relieve pressure on the French at Verdun, but what a waste. Western front WW1 is nasty business. Thank you – the losses were just astounding as you say on the first day. I too had that view of Haig but I have done a lot of researching for these games and I have some more respect for his abilities now. He was essentially trying to fight a modern war with pre-modern means, so his plans simply failed. Its interesting to see through, and as a cause of, the battle the development of tactics and technology to a point where we would recognise modern warfare. At the start the basic commanding organisation was a corps, and the opposing forces attacked in company lines versus an enemy in a trench with machine guns. By the end the basic command element was the division, the squad/platoon was self contained and used as the basic battle unit, all arms integration went down to the platoon and defences were based on flexibility and depth, with infiltration and fire and move tactics to the fore. I am hoping my game will show this progression. As to Haig, well politically he had to go earlier then he wanted to, he felt the new volunteer divisions were not ready, and he had to accept the French were not going to help with the 30+ divisions they had initially promised. He also wanted to go with tanks from the start but they were not ready. Should he have started when he knew some of the corps plans were not adequate? Should he have continued when it was obvious that the tactics and technology/communication were not capable of supporting a breakthrough and exploitation? He bears some responsibility, but some of the moral responsibility also lies with the politicians. Interestingly there is doubts now that it made any difference to the German attack on Verdun. WW1 is a very nasty business, but for us as wargamers and history buffs its very interesting.